Spyke is up to his usual chainsaw tricks in the 12 Days Of Munchkin Coloring Book, which I'm 99% sure will get him on Santa's naughty list. I don't think Spyke cares, though, because he gets to slay monsters all season long! It's a munchkin's dream come true. Inside you'll find 12 ready-to-color line drawings of Spyke's chainsaw-fueled holiday, drawn by Len Peralta (Star Munchkin Guest Artist Edition, Munchkin Apocalypse Guest Artist Edition). Of course, the coloring book also comes with 10 promo cards featuring Len's distinctive style, because the holidays are a time for giving. 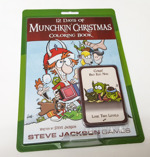 Make sure to include the 12 Days Of Munchkin Coloring Book on your wish list; it'll be available in November!